305 x 217 mm. – 180 leaves: ff. , CLXXVI. With 165 (8 full-page) woodcuts in contemporary colouring. Second illustrated edition of the complete works of the famous Roman playwright Terence, the six comedies he wrote during his short life: Andria, Eunuchus, Heautontimoroumenos, Adelphoe, Phormio, and Hecyra. New to this edition is the Directorium vocabulorum, and Francesco Petrarch’s Vita Terentii. 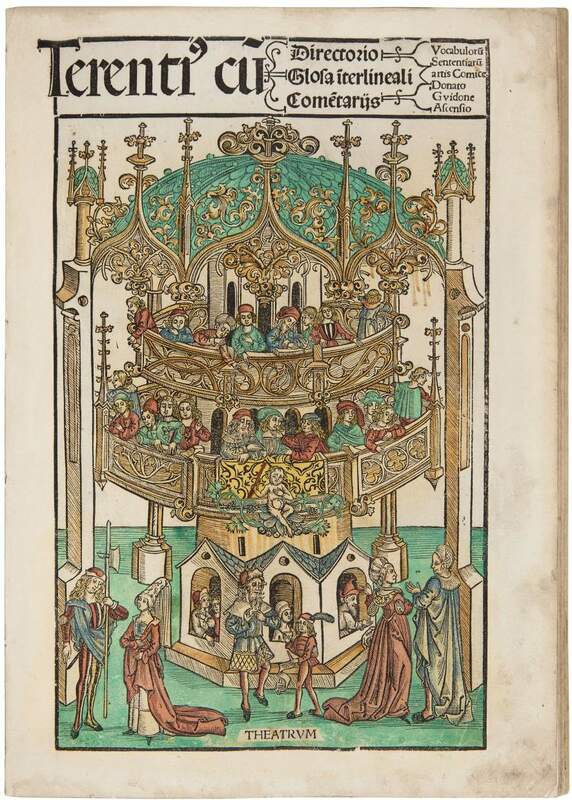 The edition is abundantly illustrated with remarkable woodcuts by the ‘Master of the Grüninger Terence’, who frequently worked for Grüninger and brought the Strasbourg woodcut to its height. With his advanced technique of fine, narrow hatching, this artist marks a stylistic shift in German book illustration, particularly in representing tone and dimensionality. The present book is the first important work with cuts in the new style. The series is based on that of Trechsel’s preceding edition (Lyons 1493). The large title woodcut shows a theatre, with the actors on stage and spectators on two levels. The full-page woodcuts opening each of the six plays are new to this edition. They show the respective play’s characters and their relations indicated by lines. Grüninger’s edition is of particular interest for a technical innovation: the images at the scene divisions are composed of up to five small woodblocks, which provided a range of various depictions. This was probably done for economic reasons, as small woodcuts could be combined variously to create large scenes. Moreover, the publisher needed only 88 different woodblocks for the 159 illustrations in this book. The technique became characteristic for Grüninger’s printing shop. The expressive and colorful woodcuts are striking in size, quantity, and artistic merit. They function as book illustrations as well as theatre documents. The narrative scenes not only illustrate the dramatic text by depicting characters on stage, as theatre documents they also provide a dynamic commentary on the text.